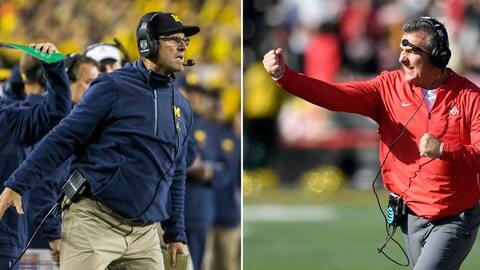 The signs point to a breakthrough for Jim Harbaugh and the Wolverines (10-1, 8-0 Big Ten, No. 4 CFP). Michigan has lost six straight and 13 of the past 14 meetings but is four-point road favorite Saturday. Win here, and again next week over Northwestern in the Big Ten championship game, and the Wolverines should be playoff-bound. That’s easier said than done. This is, after all, “The Game.” Ohio State (10-1, 7-1, No. 10 CFP) has not looked good the second half of the season but, though it would need some help, still has viable playoff hopes if it can beat Michigan and win the Big Ten. The Huskers‘ offense had over 450 total yards in seven straight games before being slowed down in the snow and cold in a win over Michigan State last week. Rain and temperatures in the 40s are forecast Friday in Iowa City. Adrian Martinez is one of the best freshmen in the country, and senior Devine Ozigbo is a 1,000-yard rusher. But the Huskers need injured WR JD Spielman back to complement Stanley Morgan Jr. Iowa is second in the Big Ten and sixth in the nation in total defense, and only two opponents have put up more than 400 yards. Iowa’s defensive ends, particularly A.J. Epenesa, present a huge challenge. With a win over Illinois, Northwestern would post its 15th victory in 16 Big Ten games to match the best 16-game stretch in program history. … RB D.J. Knox, WR Rondale Moore and QB David Blough could pull off a first in the 130 years of Purdue football — a 1,000-yard rusher, a 1,000-yard receiver and a 3,000-yard passer. Knox needs 174 yards to make it happen. The other two have achieved their milestones. … Indiana freshman RB Steve Scott has become the 19th Hoosier to reach 1,000 yards in a season. … Lovie Smith made his mark as a defensive coach in the NFL, but his Illinois defenses have gotten worse each of his three seasons. The Illini national rankings have gone from 61st to 86th to 128th. This year’s unit is allowing 520 yards per game. … Michigan State has had four starting punters this season and is the only school in the nation to have five players punt. … If Rutgers loses to MSU, it will mark the fourth time since 1997 the Scarlet Knights have finished with a win total of one or zero. The Terrapins (5-6, 3-5) need one win to get bowl eligible, which would be quite an accomplishment in a tumultuous season. The question is whether the Terps have much left in the tank after coming up just short last week in the 52-51 overtime loss to Ohio State. Penn State (8-3, 5-3) has beaten Maryland sounded two straight years. If Terps RB Anthony McFarland keeps playing like he has lately — 508 yards the last two games — this could get interesting. The national rushing leader needs 131 yards against Minnesota to hit 2,000 for the season after falling 23 yards short last season. Taylor has 714 yards over his last three games, including a national season-high 321 last week against Purdue. Minnesota has allowed more than 300 yards rushing to three opponents.